According to the latest data available, released in 2016, as many as 40 Polish nationals joined Daesh in Syria and Iraq. Their numbers may be low, but their return to Poland presents a threat. Moreover, they may link up with homegrown informal cells. In addition, Islamic radicalization and far-right extremism – on the rise in the country – tend to interact in unpredictable ways, making Polish counterterrorism efforts harder. That said, in the European security context, Poland does not have a high profile. This is understandable: in the fight against jihadism, European counterterrorism players have focused on countries facing the biggest threats, such as France, Belgium, Spain, and the United Kingdom. However, the radicalization phenomena taking place outside core focus countries must be investigated too, and here more should be done. Consider the attacks in Copenhagen on February 14, 2015 and Turku in Finland on August 18, 2017. They are striking examples of terror in non-focus countries. The fact that Poland has not been targeted yet should not lead to complacency. Instead, monitoring and prevention strategies should be improved. In this scenario, finding the right partners within the Muslim communities is a crucial priority. Poland does not have the same colonial legacy as some of its Western European counterparts. Nor is it home to many Muslims. Today the number of Muslims is actually significantly lower than before the Second World War and remarkably lower than in other European states. Muslims are estimated to make up less than one percent of the population. However, with the influx of Turkish, Chechen, and Arab migrants, and an increase of conversions to Islam, these figures are likely to rise significantly in the coming years. A widespread reaction towards this trend is what has been effectively termed “Platonic Islamophobia”: the supposed near absence of Muslims born in Poland together with a high prevalence of hostile attitudes towards that group suggests that Muslims in general and converts in particular have to actively and constantly defend their choice in their interactions with other Poles, as if Islam was something completely alien to European and Polish culture. As several comparative studies have shown, Poles (excluding the Tatar minority) have limited contact with Muslims compared to the populations of Western European countries and Poland is one of the European nations that is most afraid of Islam and Muslims. Krystian Ganczarski was a convert to Islam who took up jihad in Germany. He had migrated there with his family in 1970. Ganczarski is the most notorious representative of the Polish older generation of jihadist fighters, belonging to the al-Qa’ida galaxy of the 1990s. In February 2009, a French court found Ganczarski guilty of masterminding the 2002 suicide bombing of a Tunisian synagogue on the island of Jerba that left 21 people dead and sentenced to 18 years in prison. A younger Pole, Adam al-N, has been serving a four-year sentence in Jordan. His mother was Polish, his father Palestinian, and he has both Polish and Jordanian citizenship. Like Ganczarski, he radicalized in Germany. In October 2012, he went to Syria, where he joined Ahrar al-Sham, al-Nusra, and later the Islamic State, from where he went back to Germany and was later deported to Poland. In 2015, he gave an interview — the first by a Polish jihadist fighter —explaining the reasons why he joined Daesh and was subsequently arrested in Jordan a couple months later. In the first two cases, radicalization occurred in a context of migration and the two Poles belonged to the first and second generations of migrants. Other stories, however, shows that the process can happen in Poland as well. Such are the cases of Dawid Ł. nom de guerre Abu Hanifa, and Jakub Jakus, nom de guerre Abu Khattab al-Polandi. Dawid Ł., on trial in Poland, converted to Islam while in the country and probably completed the process in Norway, where he emigrated with his parents. Dawid and his wife Małgorzata both went to Syria in winter 2014 and spent a year there. When Dawid Ł visited Norway in April 2015, he was detained by the PST, the Norwegian security services, and finally deported to Poland in 2015. Jakub Jakus converted while he was attending a Catholic school in Lublin. He then moved to the Polish city of Łódź and became a well-known Islamic activist within the ranks of the Muslim League, one of the two major Islamic associations in the country – which will be described shortly. After his hajj in 2012, he emigrated to Norway, where he was likely recruited with David Ł through members of the local organization Profetens Ummah. From Norway, Jakus travelled to Syria in June 2013 with three other members of Profetens Ummah and allegedly died in the country. More than ten Muslim organizations are active in Poland but two major groups claim to be the sole representatives of the Muslim communities in Poland. The Muslim Religious Union (Muzułmański Związek Religijny, MZR), established in 1925 and officially recognized by the state in 1936, had the monopoly as the Muslim representative body until 1989, when a new legislation was introduced. After the Second World War, the MZR elected its mufti of Poland. Since 2004, this role has always been played by Tomasz Miśkiewicz, who completed his Islamic studies in Saudi Arabia. Until the end of the 1990s, however, the MZR was open only to Muslims with Polish citizenship, which essentially meant citizens with Tatar origins. In this way, not only did the Union end up being Tatar-dominated, but it was also doubly-recognized, getting state support as a representative of both a religious and ethnic minority. Tatar roots in Poland are deep. The first Tatar groups settled in the Poland-Lithuania area in the late 14th century. They were brought to the region by the Great Prince of the Grand Duchy of Lithuania and granted settlement rights in return for their military services. As far as the multi-layered identity of the group is concerned, Tomasz Miśkiewicz once declared: “I am a Polish Tatar. Poland is my country and Islam is my religion”. Historically, the Polish government has been very tolerant in regards to the rights and customs of these Muslim minorities. For example, Poland allows the halal ritual to be performed on animals which are to be slaughtered for consumption, a ritual that is forbidden in many neighboring countries. Furthermore, for the Tatars there is an additional special bill which guarantees the Muslim Religious Union distinct cooperative rights with the government. Inevitably, the exclusivist nature of the MZR was one of the factors triggering the creation of the second major Muslim representative body, the Muslim League (Liga Muzułmańska). It was set up in 2001 and officially registered in 2004. Its mufti has always been Nidal Abu Tabaq, from the Muslim Center in Lublin. The Muslim League is almost entirely composed of foreigners and converts. Notably, one of its informal leaders, imam Abdelwahab Bouali, the manager of the Islamic Centre in Białystok, criticizes Tomasz Miśkiewicz for not representing all Muslims in Poland. Another prominent figure, Muslim League head Samir Ismail, is known to have also been the head of the Qualification Muslim Cultural Society, the Polish member organization of the Federation of Islamic Organizations in Europe (FIOE), the de facto umbrella body for Muslim Brotherhood groups in Europe. Over the last fifteen years, the Muslim League set up branches in all major cities, including Warsaw, Lodz, Krakow, Katowice, Poznan, and Lublin. 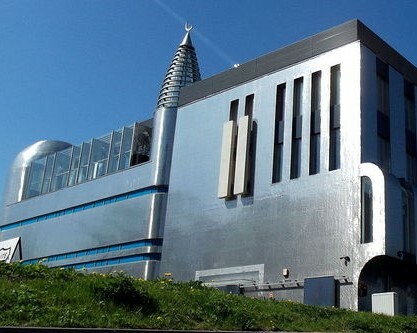 In 2010, it started to build the biggest mosque in the country, the Muslim Cultural Center in the Wilanoma area of Warsaw. In this project, it decided to rely on foreign donors instead of state funding. It also publishes books and the quarterly Al-Salam. The tensions between the two groups are quite clear. On one side, there is the historical accommodating attitude of the Polish state towards the Tatars and the fact that today having Tatar ancestors has become a source of pride within the Muslim community. The notion has become especially popular amongst Tatar youth, who have become interested in recreating their historical identity. In addition, tourists in Poland are now beginning to visit Tatar mosques, cemeteries and traditional Tatar restaurants. On the other side, growing numbers of Chechen, Turkish and Arab Muslim communities are settling in and their representative, the Muslim League, won the mosque construction project. Many of these “new” Muslims are highly skeptical about the Tatars’ devotion to Islam and some Chechens in particular, who are on average less secular that the Tatars, often don’t even recognize them as fellow Muslims. Undoubtedly, the Muslim Religious Union’s entrenchment within the Polish state carries the potential to create further fractures between this group and other Muslims. In line with what has been happening in recent years in other countries, the tensions are based on one crucial issue: the attempts by the state to find a reliable interlocutor within the Muslim community. In order to achieve this goal, authorities face the dilemma of representation: they are forced to strike the right balance between groups who are historical allies and quite trustworthy but do not – or no longer – represent the majority of Muslims, and newer groups who might include radicalizing elements, but are unquestionably more able to appeal to the new social groups of migrants from Muslim-majority countries. B. van Ginkel – E. Entenmann (Eds. ), The Foreign Fighters Phenomenon in the European Union. Profiles, Threats & Policies, International Centre for Counter-Terrorism, The Hague, April 2016, p. 46. K. Gorak-Sosnowska, Muslims in Poland and Eastern Europe. Widening the European Discourse on Islam, University of Warsaw, Warsaw, 2011. K. Pędziwiatr, Islamophobia in Poland. National Report 2016, in E. Bayrakli – F. Hafez (Eds. ), European Islamophobia Report, Foundation for Political, Economic and Social Research, Istanbul, 2017. W. Gadowski, Rozmowa z polskim dżihadystą Adrianem Al N. “Zginiecie jak wszyscy niewierni” [Conversation with Polish jihadist Adrian al-N. “You will die like all the infidels”]: [https://www.youtube.com/watch?v=QF9qrp_-TYM&t=358s]. C. Jentry – K Sacha – N. Sokolova, To Be or Not to Be: The Tatar Identity. Promise or Problem?, Humanity in Action: [https://www.humanityinaction.org/knowledgebase/66-to-be-or-not-to-be-the-tatar-identity-promise-or-problem]. L. Vidino, The New Muslim Brotherhood in the West, Columbia University Press, New York City, 2010, p. 51.